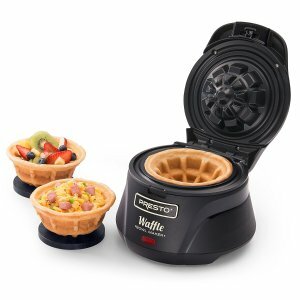 Amazon.com offers the Presto 03500 Belgian Bowl Waffle Maker, Black for $14.99. Features:Makes a 4-inch waffle that's thick, fluffy and tender because it's a real waffle. Fill with your favorite toppers: butter and syrup, fresh fruit, scrambled eggs, ham, sausage, hash browns and more. No special batter needed; Use store-bought waffle mixes or homemade; Recipes for traditional waffles and more included.